What: A collection of one-color plastic and rubber aliens/monsters. The Space Creatures are made up of eight sculpts (in order, as pictured in the top photo above): Lizard Man, Tree Trunk Monster, Insectman, Winged Amphibian Creature, Veined Cranium Creature, Vampire Bat Creature, Gill Face Creature and Horned Cyclops. 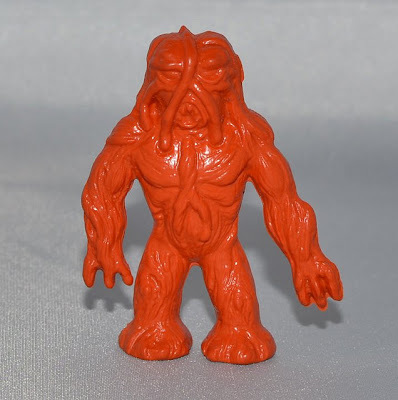 Each of these sculpts is based on a creature from a retro sci-fi movie or TV show (for details on that, check out this blog). They were produced in both harder plastic versions and softer, eraser versions. 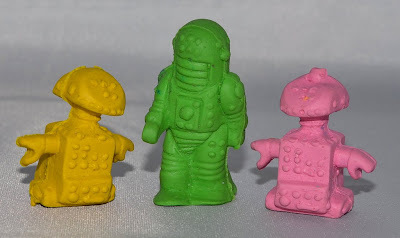 The Space Raiders is a similar line, consisting of very soft rubber aliens with more robot-like sculpts. When: These guys have been around since the 1970s, sold over the years in various formats. Where: The different incarnations of these figures have been sold in a variety of places over the years, from dime/variety stores to McDonald's Happy Meals in the late'70s/early '80s. Hey Rich, thanks for reading and for your kind words! Very interesting. 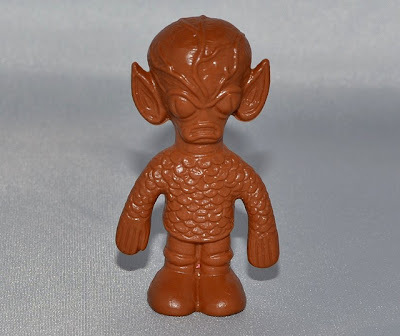 Unveined Cranium Guy with the pointy ears is definitely modeled on the aliens from "Keeper of the Purple Twilight" in the original Outer Limits. Veined Cranium resembles the little dudes from Invasion of the Saucer Men. Tree Trunk Monster is certainly based on the aliens from I Married A Monster From Outer Space. 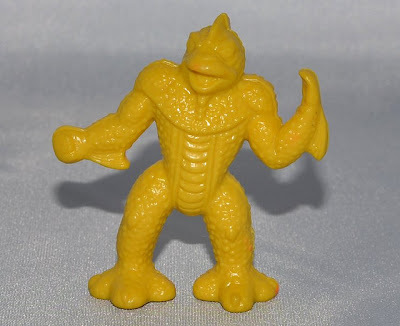 Lizard Man bears a vague resemblance to the Ymir from 20,000 Miles to Earth. I figure we have images from something like Famous Monsters of Filmland to thank for this. My very first Diener Space Creature... It was the purple eraser-style Lizard Man, around 1990-ish. I kept him in my pencil case for a while, using him as a rubber! That's around the time I got my first ones, too. Orange, yellow and blue eraser ones, from Walgreens I think. I still have them! I had the Space Creatures and some of the Mythological Creatures in the harder plastic versions, and I know my Mom bought them for me around Halloween around 1986 or so at an Acme supermarket. They came bagged (Mythological creatures in one set, Space Creatures in another). 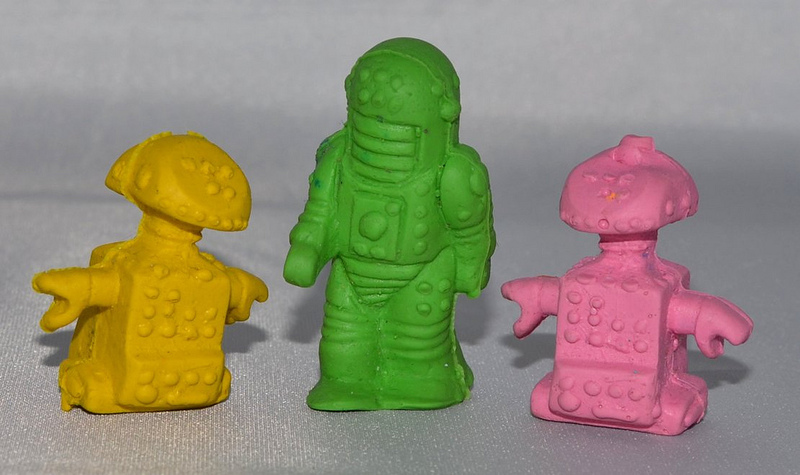 I'd like to find these again but can only seem to find the softer rubber eraser versions online. I'm guessing the versions I had were possibly done in harder plastic to appeal to kids who liked the M.U.S.C.L.E. toyline (like me) but were made in much less abundance.